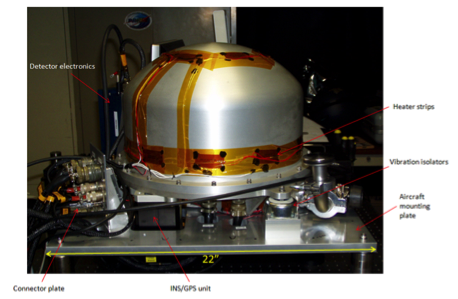 The Portable Remote Imaging SpectroMeter (PRISM) is a compact, lightweight pushbroom imaging spectrometer compatible with a wide range of airborne platforms (Mouroulis et al., 2014). PRISM measures radiances in the near ultraviolet to near infrared spectrum (350–1050 nm at a spectral sampling of approximately 3 nm). PRISM integrates technologies that as a system achieve high signal-to-noise ratio, high uniformity, excellent dynamic range, low polarization sensitivity, stray light suppression, and calibration stability. See Table 1 for PRISM characteristics. The complete sensor comprises the optical head assembly (OHA) and control electronics. At about 40 kg, the OHA comprises the vacuum vessel with the spectrometer and a shortwave infrared (SWIR) radiometer inside, an aircraft interface/mounting plate, an INS/GPS unit attached to the optical head for enabling precise orthorectification and geolocation, as well as the preamplifier and A-D converter for the detector electronics. The vacuum vessel shell is temperature-stabilized to around 26°C with external strip heaters. Required vacuum level for stable operation is < 3 mTorr. The instrument retains this vacuum level through a typical flight without on-board pumping. Three commercial vibration isolators prevent high frequency vibration from transmitting to the optics and detectors. 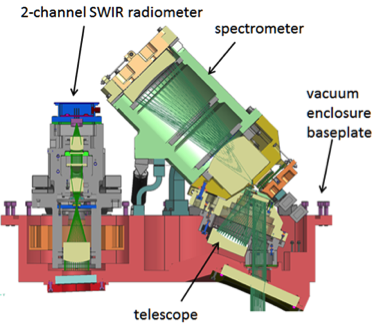 The PRISM spectrometer incorporates several innovations including a fast and uniform design with a total internal reflection fold, a polarization-insensitive shaped groove concave grating, a black-Si slit for uniformity and stray light reduction, and a fast, wide angle two-mirror telescope. The spectrometer is of the Dyson design form which permits a high throughput (F/1.8) and also provides low angles of incidence for controlling polarization variation. All transmissive elements are made of fused silica with a high-quality broadband anti-reflection coating. Photograph of the concave diffraction grating and measured groove profile of same. The blazed first order can be seen displaced from the zero order observed most strongly on the unexposed outside ring.